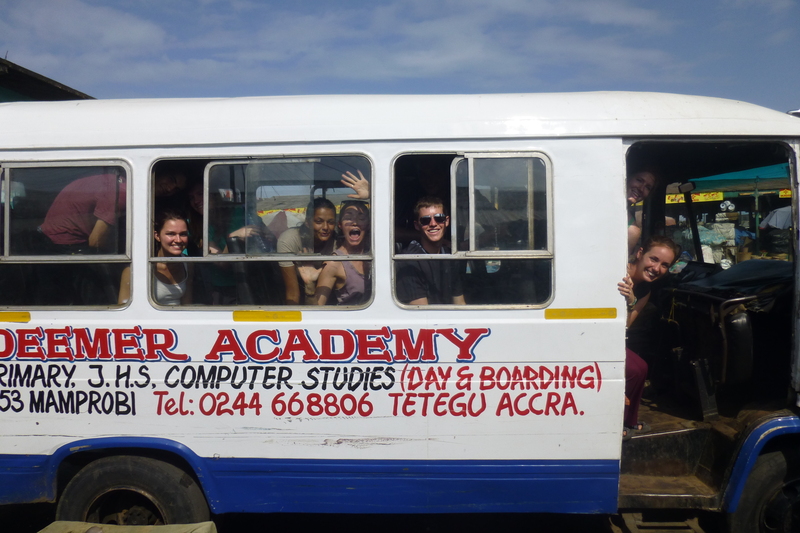 The Sights, Sounds, Smells and Tastes of Ghana! 26 Jul The Sights, Sounds, Smells and Tastes of Ghana! Written by Connor Young, West Africa Discovery. 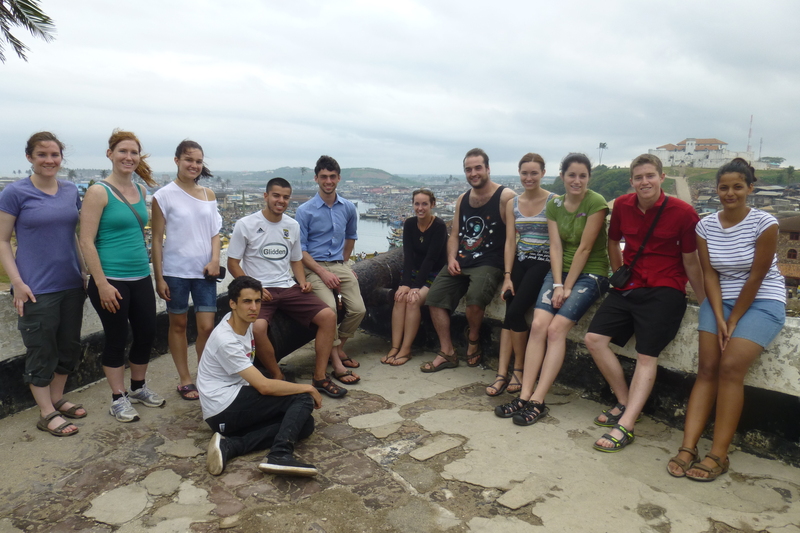 Our group has been in Ghana for a full three weeks now and the culture shock has begun to subside. From the capital in Accra, to the mountains of Wli Todzi and now all the way to the Upper East at the border of Burkina Faso, our team has been consistently finding ourselves in unfamiliar situations. Whether it is walking through a local market or taking a ten hour tro-tro ride (local mode of transportation), our senses have been in constant stimulation. Hopping on the tro-tro…it’s the only way we roll! Every time we enter a market, our noses are filled with new and unrecognizable scents. One of the most powerful smells is the salted fish that is laid out to dry in the sun. This scent is everywhere! 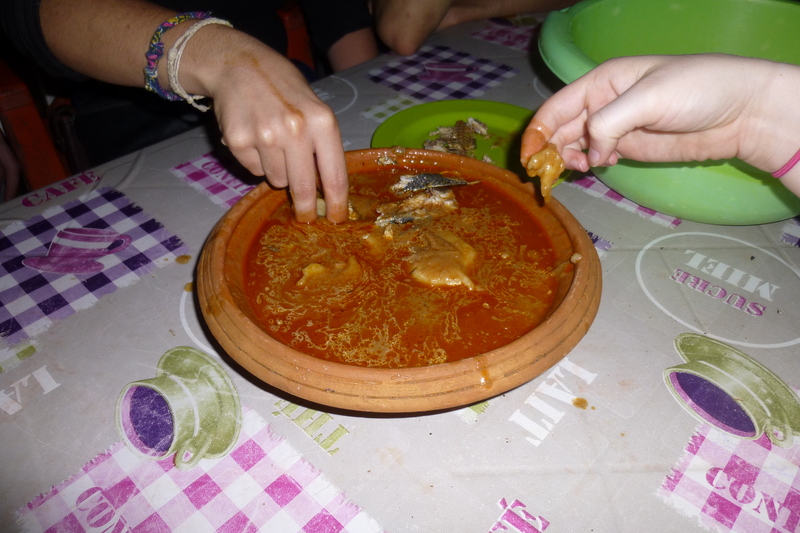 Ghanaians have fish in many of the dishes they cook and it is definitely a cultural food staple. There are many other Ghanaian dishes that remind our noses that we are not at home. 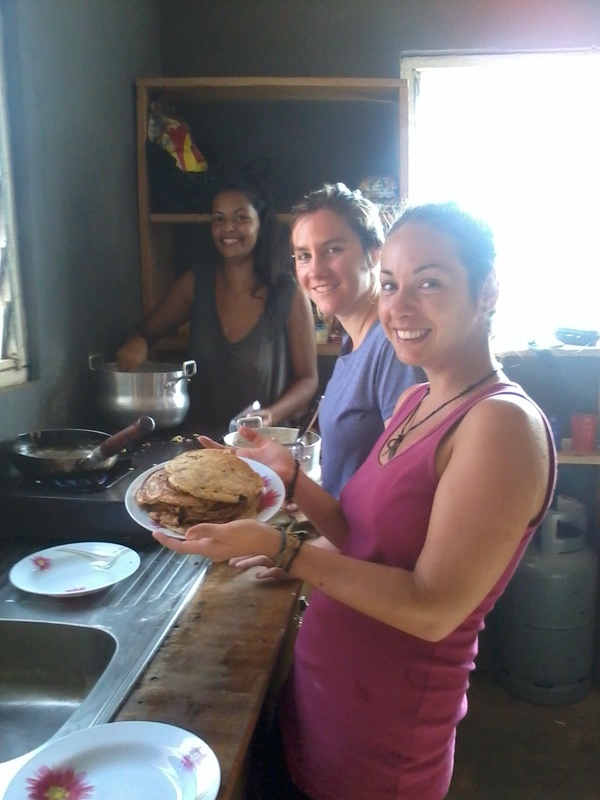 Although we enjoy trying the new foods, it has been nice waking up to familiar scents of western cooking from the kitchen in the mornings since arriving in our home-away-from home in Sandema. As the twelve of us share a house, we also share chores and each morning a new team of two is responsible for going to the market to buy the food and prepare the meal for the rest of us. Along with new scents come new tastes. Fufu and banku are two classic Ghanaian dishes. They are essentially globs of dough made from cassava root and plantain. The dish is served with the starch swimming in either groundnut soup (what we would call peanut butter soup!) or light soup. You eat them with your hand and try not to chew it…or else the locals will probably point and have a nice laugh! We’ve also recently discovered Kose, a deep fried bean patty that is eaten with onion and pepe (ground hot peppers). It has become a group favourite and is a great snack for tro rides! Pepe is a spicy sauce or can be made into a powder that is put on almost every dish in this country. It makes everything super spicy but adds so much good flavour! Waakye is a dish of beans and rice that has also become a group go-to for lunch. After most meals, we have a desert of Fanice, a soft ice cream that comes in a bag. One of the most common things we have held in our hands is plastic bags; in Ghana they use plastic bags, or ‘rubbers’ for everything. Whether it’s the Fanice, drinking sachet, rice, hot tea, food to go or market groceries – it comes in a bag! Sometimes we’ll have fruit, although it is much more difficult to get in the north compared to the south. The pineapples, mangos and oranges here are so tasty and sweet that they cannot even be compared to what is available back home. One of the best things about Ghana is the energy that goes hand in hand with all the sounds. Everywhere you go, music is playing, people are talking and children are laughing or crying…or yelling Smali, Smali at us (meaning foreigners). The most popular local genres are Raggae, Azonto, Gospel, Hip Life, High Life and the new craze Al Queida. No matter how early or late it is, you can always hear the music – and the Ghanaians love their bass! During the day we hear bleating goats, chirping birds and the little kids running after us. At night the most common sounds are the termites around the lights, crickets in the grass and bats screeching – sounds our group has championed and are now accustomed too (as opposed to the beginning when we were totally freaked out!). There are many different languages spoken in Ghana and almost every city has its own dialect. So far, we’ve heard English, Twi, Ga, Ewe, Dagbani, and Frafra. 2013 OG West Africa Discovery! Beyond the sounds, some of the best parts of Ghana are the sights. We have seen beautiful lush green mountains and as we hiked through the mountains we saw a gorgeous waterfall. It must have been at least 50 meters high! Every time we hear music, there is at least one person dancing…usually more. The Ghanaians are great dancers and we are learning a lot of new dance moves, let me tell you! Now that we are in the north, we see motorcycles everywhere. A lot of people can not afford cars so motos are a good alternative. As you travel north through the country, the number of mottos is also taken over by bicycles. One of the most amazing sights in Ghana is the night sky. The lack of light pollution, especially in the rural areas, allows us to see so many stars and sometimes even the Milky Way. In the evenings, we will go for walks just to look at the evening sky and share stories. Among everything we have smelled, tasted, heard or seen I think the thing we have felt the most is the welcome. This is a common trend. Amongst all the random dance parties, someone always invites you to join. If you are walking on the road, it is likely someone will offer you a ride on their moto. If others are eating, we are always invited. In conversation people ask when we arrived and always respond, ‘you are welcome’. Even at Horizons Children’s Centre, our main partners in the Upper East, our first night they presented us with a song, “You are welcome, you are welcome, you are welcome to HCC”. Everywhere we have been in this country, the people are so kind, generous and welcoming! Stay tuned for more sights, smells, sounds, and tastes!